Tote Bags. Large Natural Tote  - $12.56 : Yarn Tree, Your wholesale source for cross stitch supplies. Item 5173. Large Natural Tote Bag. 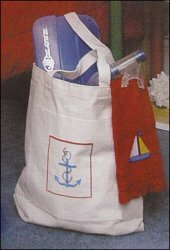 Take your stitching with you in this roomy 100% cotton tote from Charles Craft. Easy to personalize with a 14ct woven insert. Design area 9”x9”. Large tote measures 14” across by 14” tall x4” wide. Hand washable. Free design included. Available in natural with natural handles or denim with red handles (Item 2658).